The Kingpins New York show wrapped another successful edition yesterday after a two-day run. Fresh off its positive edition in Amsterdam at the end of last month, the fair was held once again at Basketball City in Lower Manhattan and featured about 75 exhibitors from the denim-supply world including major players such as Cone Denim and Invista and smaller suppliers from Asian countries such as China, Pakistan and Vietnam. 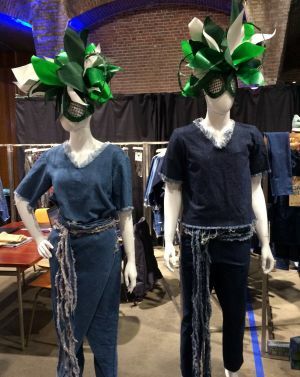 Special presentations at the show included four seminars: Denim Trends for Spring/Summer 2018: Fit, Fabric, Finish (presented on both days); Global Consumer Insights on Jeans; and Politics, Trade and the Economy: What’s Next? In addition, a special trend display area was set up on the north end of the floor and showed trends that included Future Uniform (a new type of utilitarian uniform-inspired dressing), Decayed Decadence (opulent and decorated 1970s-inspired rock looks) and Neue West (Western looks meet global nomad with patchwork, embroidery, sun-faded styles, etc.). New interesting denim developments abounded at Kingpins. Among the most compelling were Invista’s Future Black Denim, which retains its deep ebony color even after 50 washes thanks to the color being part of the fiber, Desert Studio’s new and extensive denim shirting offerings and Cone’s Performance Denim line, which includes it S Gene stretch, Cone Climate (moisture wicking and cooling), Cone Strong durable denims and Conegard, which combats odors and stains. Cone also revealed that it will soon officially release a new fabric with Thread International that is made with 65% recycled material. Overall, retro-look denim continued to be one of the top categories at the show whether in traditional all-cotton selvedge or with technologically advanced stretch. The next edition of Kingpins will take place in Hong Kong on May 24-25, 2017.